The number one concern of most new dog owners is potty training. The most misdirected interaction to train a new puppy is also probably potty training! It isn’t going to be immediate; it takes time! Humans don’t understand what it is like to be a dog, and dogs don’t really understand what it is like to be a human; this is where the miscommunication lies. Puppies don’t know that going potty in the house is a mistake, yet the vast majority of owners expect that their puppies come with this understanding. Let me assure you; he does not know that going potty in the house (poop or pee) will result in anger or even displeasure from you. Chances were when he was living with his littermates, they all used “the bathroom” whenever the desire hit. 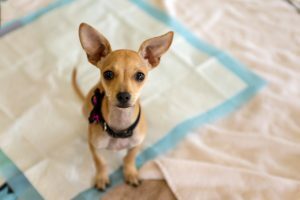 As humans, we don’t want him to toilet inside or have “accidents” and luckily training a puppy is easy if you have a few essential step-by-step rules that you can follow that are proven to train a puppy! After all, we all need to know how to successfully potty train a puppy! And, training a puppy is easy if you know what you are doing. But remember it takes time to teach him where the appropriate area where he can go is for him to be successful! 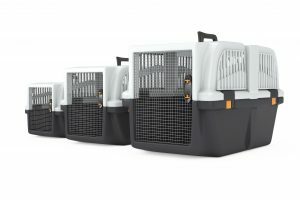 As soon as you bring your dog or puppy home, or even before you go to get him, make sure you have an appropriately sized crate. Crate training is the best way to potty train a puppy. I suggest buying a crate that will fit when he is an adult; it is easier and cheaper; if you do it right. The majority of dogs do better with a plastic or dark crate because in the wild dogs are den animals that live underground. Most people mistakenly get the open wire crates because they think they look more humane. The truth is the stimulation of being able to see everything going on around them can make them more restless, and more difficult to crate train. Potty training a puppy is so much easier with a crate! Puppies are less likely to soil the area when the area is small. I certainly wouldn’t want to sit in my urine or feces either; so it teaches the puppy to learn to hold his bladder, and this is the first step to having a truly potty trained puppy, but it may take a little time! The truth is that puppies gain bladder control like babies gain bladder control and that takes a little bit of time and waiting for them to mature. Most crates come with an inside barrier that can be used to make a big crate smaller, so you can get him a big dog crate and downgrade for toilet training. For instance, if you have a German Shepherd puppy that you want to train you probably don’t want to buy three crates as he grows and matures. A crate barrier will allow you to make his full-sized kennel a bit smaller to help promote potty training! Make sure that the crate isn’t all about leaving the puppy for long periods of time, positive reinforcement like feeding your puppy in his crate and playing crate games will be invaluable for his love of his crate. I still reward and occasionally jackpot my adult dog for willingly running to their crates when asked. After all, a happily crate trained dog that loves his crate is invaluable throughout his life! Also, be sure and crate the puppy for short periods of time while you are home. Turn up a radio or turn up the TV so he doesn’t hear each little move that you or your neighbor make. Be sure he gets used to you being there while he is in his crate and reward him for short positive, quiet, periods of time spent in his crate. If the puppy is always left for long periods, and you either aren’t home or aren’t awake, the crate can become a precursor spending long periods of time in his crate, which he may not like. I am not a fan of either paper training or using puppy potty pads. Most dog owners thing this is the best way, but I think that paper training will encourage your puppy, or even older dog, to urinate on any paper products left on the floor (you don’t want your child to have to explain why he doesn’t have his homework the next day). And, potty pads can encourage puppies or adult dogs to urinate on soft items like carpets, towels, and laundry that has been left out. Potty pad training never works out the way you envision. Your puppy is going to have a couple of accidents. Potty training is a process, but it is all about getting him outside as often as possible so that he has success and limiting his access to the inside until he is nearly potty trained to the right area . I use a leash on all my puppies while we are working on “toileting outside” not only does the leash enable me to help him work on his regular obedience manners, it also is instrumental to the potty training process. Being on a leash and near me forces me to pay more attention to my puppy and deal with his naughty behaviors. Being on a leash also makes it impossible for your new puppy to sneak off in another room in the wrong area and have an accident, or sneak off and chew on something he shouldn’t have in his mouth. 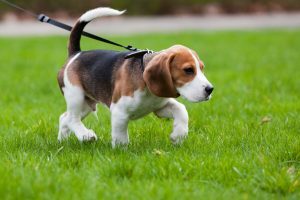 You’ll quickly notice your dog’s behavior change when he needs to go outside because he will become restless and begin to dance uncomfortably on the leash. Housebreak your puppy right, and take him to the right spot! I will admit, it isn’t always fun, keeping your puppy on a leash indoors with you, but the benefits far outnumber the inconvenience. Did you know all guide and service dog organizations force you to keep the puppy on leash all of the time? This is because it keeps the puppy from developing bad habits and it forces the surrogate owners to be good parents and teach the dogs obedience through forced exposure. Again, I am not going to let you jump on the counter, jump on the visitor, grab the cat, or grab the underwear if he is on a leash! Treat him when he leaves distractions and pays attention to you. Eventually, room dividers will help you manage your dog and his behaviors. If you can keep him out of a certain space and yet confined to a certain space, you can ensure a more successful potty training experience as a whole. Don’t move to room dividers until your dog is fairly reliable. Then, keep an eye on your dog and make sure he is getting out as often as you need. Potty training is more about potty training “YOU” than it is about potty training HIM! The other key to success is making sure your new puppy gets outside about every two hours. He may need to go out even more often than that after certain situations. Puppies usually need to go outside to the right area about 10 minutes after eating or drinking. They also need to go out after strenuous play. They need to go potty after sleeping. Think of it this way, you can’t get him out to the right area too much, but you can take him out too little causing him to make urine or feces accident. Make sure that you are going out with your puppy and monitoring him while he is outside. Not only do you not want to allow him to chew on things he shouldn’t or dig up your yard, it is critical to learn his potty schedule. All puppy potty schedules are a little different, but each puppy will have one. One of my puppies would poop three times daily, morning, noon, and night and urinate after water consumption and about every two hours. Once I learned that, I could watch the puppy if he missed one of his outside scheduled potty episodes. If I don’t know my puppy’s schedule, he is more likely to have an accident. Puppies get distracted while outside. They may be mid-stream and notice a butterfly and stop to give chase, or they may be so busy sniffing what critters were in the yard the night before that they forget to utilize the time to use the bathroom. Remember, when your puppy is young it is up to YOU to make sure he isn’t having accidents in the house. The more you know about him and his habits, the more you set him up for early success and move through the potty training stage! Honestly, I am all about positive reinforcement training and using treats and rewards, but I don’t recommend it for potty training. From the puppy’s perspective, he is being rewarded for going to the bathroom, the behavior he is currently showing. He doesn’t understand that he is being rewarded for going to the toilet OUTSIDE! You may think he draws that conclusion, but I assure you after my 25+ years training that he is not. This is why many of my clients come to me and say their puppy will urinate outside and then come inside and urinate in front of them almost immediately. Your puppy is working for that treat! Instead, while my puppy is going potty, I quietly praise him. You don’t want to be over the top about it and stop what he is doing, just reinforce that what he is doing and where is something you like. Then if you catch him going potty inside stop him with an abrupt sound “Ahhh” (not too scary), then get him outside and quietly coo and praise when he continues to go in the right area. This makes it clear that “place” is important and he is also not just getting in trouble for going potty in front of you. My last point brings my explanation here; don’t over correct a urinating or defecating puppy. Don’t rub his nose in it and don’t swat him. Also don’t YELL or scare him in anger. By doing so, you are teaching him never to urinate or defecate IN FRONT OF YOU. How confusing is that? What we want is a puppy who is willing to go potty outside with us, so we don’t want them to think that the act of toileting in front of us is wrong. After all, your puppy is going to have to “go” you just don’t want him to learn it is easier to sneak away from you. It is acceptable to try and stop him if you catch him in the act, but kindly take him outside to the correct area and continue the lesson that being outside is where he should be going potty. Having a potty trained puppy will lead to having a well potty trained dog and a dog that knows where to eliminate in the correct spot outside if you take the time to train him while he is young! Yes, it takes a bit of effort, but everything good in life takes effort.